The word ‘vibhuti’ also denotes this very pursuit. In the divine language, Sanskrit, bhuti refers to aishwaryam (wealth or treasure). Vi refers to something that is valuable beyond imagination. The greatest and most valuable treasure is 'that seeking which one need not seek ever again' or 'that knowing which one knows everything'. And THAT is the reason why it is often said that one who wears vibhuti need not wear anything else. THAT is the reason why the great Lord Shiva is praised with the epithet, “Digambara” (one who clothes Himself with the skies alone) because he ‘wears’ vibhuti all over Himself. Shiva ‘wearing’ vibhuti conveys the truth that He is insulated from all existence though He is covered by the very same thing! Vibhuti also calls to mind the story of incineration of Kama Deva (the god of desires) by Lord Shiva, the message of which is that, ultimately desires become dust (vibhuti). We are often innocently ignorant of the marvel of that bright little dot on the forehead! It was as a child that I had heard a small but unforgettable story on the power of vibhuti. Apparently, a devotee of the Lord adorned with a bright dot of vibhuti on the forehead was passing through a forest. In the forest, he came across an accursed well. This, the story goes, was the well to hell. The traveller heard groans and shouts emanating from the well. Curiously, he walked to it and peeped into it. The minute he did that, all the groaning and screaming ceased. The story has remained in my heart ever since and I respect and adore vibhuti from the bottom of my heart. Vibhuti also gains special interest and meaning for the devotees of Bhagawan Sri Sathya Sai Baba. Right from His childhood days, ever since He declared His Avatarhood, Baba materialized vibhuti from the thin air and prescribed it for all kinds of maladies and as all kinds of blessings - worldly and spiritual. The Vibhuti that He gave was of innumerable kinds, suited to the different purposes for which it was created. Sometimes it was in the shape of a hard cube, though more often it was a powder - fine, grainy or flaky. It could be fragrant or pungent, salty or sweet or, sometimes, absolutely tasteless. In colour, it was white or blackish, or of any of the intermediate shades. Sometimes, when He waved His Hand, vibhuti materialized - container and all! Such is Baba’s association with vibhuti that His biographer, Prof. N. Kasturi, dedicated an entire chapter entitled, “The wave of the Hand” to record it. So, it is not surprising that during some festivals like Dasara and Mahashivarathri, Swami would manifest and distribute copious amounts of vibhuti. The video below will give a glimpse of one such magnificent happening - materialization and distribution - during the Vijayadashami day of Dasara. 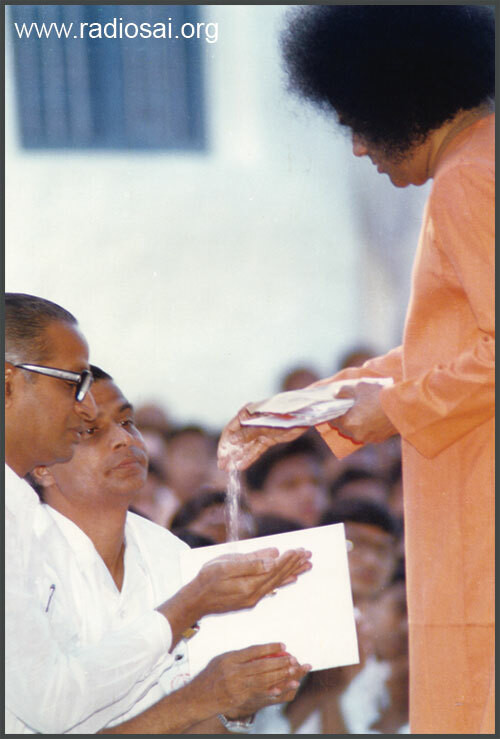 Vibhuti today, has become the Mahaprasadam (gracious gift given to all devotees as a token of blessings from the Master) in any gathering - local or international - which takes place in the name of Bhagawan Sri Sathya Sai Baba. directly by the Divine Hands. Ever since the erection of the Prasanthi Nilayam ashram, the crowds that gathered in Puttaparthi only kept increasing. Puttaparthi became a pilgrimage centre for people of all religions and regions of the world. It was only apt that something as universal as ash became the Prasad that the devotees sought in this Universal abode of Supreme Peace. The 'lucky ones' got vibhuti materialized with the divine wave of the palm. But everyone wanted a pinch of the holy ash for themselves and also some to carry back home as a token of Baba’s blessings. That was when Swami personally instituted a procedure for the ‘manufacture’ of vibhuti. Legend goes that Swami Himself gathered and cleaned cow-dung, had it dried and burnt to ashes. 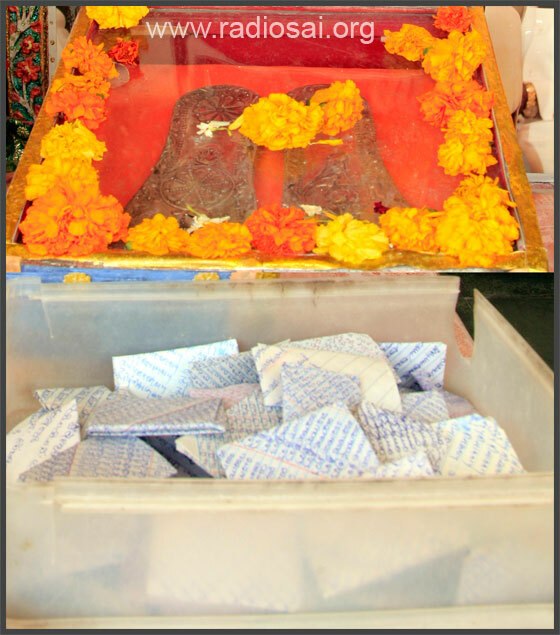 These ashes were sieved and finely powdered to result in the first edition of the vibhuti from Puttaparthi. One small paper packet of this ash was available for any visitor to the ashram to seek before leaving for his or her hometown. It was some time in the 1980s that Mr. Khialdas, the person entrusted with taking care of the co-operative general stores for the welfare of devotees, approached Swami with a request. He told Swami that devotees were wanting to take away huge quantities of vibhuti to their respective countries and hometowns. There was no way that the little vibhuti being 'manufactured' would suffice to fulfil even part of the demand. He thus sought Swami’s blessings for setting up an elaborate vibhuti manufacturing system after which the same could be sold at a very low cost. The time had arrived for the Sai mission of Love to change gears and Bhagawan Baba graciously permitted the venture. A little detour to explain the twofold purpose of this article is relevant here. There is a mistaken notion among many that all the vibhuti that they purchase in the ashram (at Rs 2/- per 100gms-packet) has been 'materialized' by Swami and stored in huge chamber for distribution via such packets. Of course, the vibhuti has been 'created' by Swami in the same sense that the Universe has been created by Him; you and me have been created by Him. But just as the Big Bang was the Lord’s instrument of Universe-creation and the parents are His instruments for getting us into the world, there is an instrumental-process that pours forth the Divine vibhuti too. The first purpose of the article is to educate the reader about the know-how and details of this process. The second purpose is to elaborately answer the question - 'now-how' is the vibhuti made? Ever since Swami agreed to the manufacture and sale of vibhuti in 1986, the raw ash has been procured from a manufacturer and supplier in Palani, Tamil Nadu. This raw vibhuti is constituted majorly from husk-ash with trace quantities of cow dung-ash (less than 1%). This ash arrives to Prasanthi Nilayam, packed in 50kg bags. The labour of love then begins wherein four different perfumes are mixed into the vibhuti in proportions gifted by Swami to a certain lady, Bujamma by name. A wall in the 'manufacturing' shed separates the works-in-progress from the packaged 'good(s)'. Two solid perfumes and two liquid perfumes were selected from among dozens brought to Swami by Khialdas. Swami called Bujamma and instructed her to mix a few tablespoons each of the liquid perfumes and a few tablespoons each of the solid perfumes into 40 bags of unscented vibhuti that arrived from Palani. (The exact measures are withheld. The exact formulation is a secret that is as guarded as the famous ‘Coke formula’. The formulation is transferred only by word of mouth and is not written down anywhere.) That makes a total of a few grams of perfume into 2000 kgs of vibhuti. The phrase ‘a few grams’ is correct because even today, the same spoons are used to add the perfumes. Electronic balances are not used for the proportion! The blessed spoon that is used to this day to measure the various perfumes to deliver the 'perfect' formula. Bujjamma was entrusted with the sacred duty of mixing the perfumes into the vibhuti in the prescribed proportion. With the help of a few male workers, she would sincerely and conscientiously go about her daily sadhana of ‘creating’ vibhuti. The mixing needed to be thorough and that would itself take several hours. Once mixing was complete, the arduous task of packing had to be completed before the vibhuti packets were ready for the devotees. One day, Bujjamma was told by Khialdas and several others that the vibhuti was not fragrant enough. Could she add a little extra perfume? As she mulled over this suggestion, her Lord visited her in a dream. There, He strictly warned her against increasing the given proportion. On the other hand, He told her to actually reduce the solid perfume to just half of the original prescription for the 40 bags of vibhuti. The divinely commanded change was incorporated and the proportions have remained the same ever since. Can you make a guesstimate of the amount of vibhuti that is disbursed in a year from Prasanthi Nilayam? Really, stop reading now, close your eyes and make a rough estimate. When I did this, I thought that the stores might possibly be selling about 5,000 kilograms of vibhuti a year. The actual number left me dumbfounded. On an average, about 100 metric tonnes of vibhuti is disbursed every year - a solid 100,000 kilograms! In fact, in 2010, this figure was a whopping 128 metric tonnes! And this entire amount is completely prepared by voluntary staff which averages 20 women! The section of the stores in Prasanthi Nilayam that earns no money but infinite blessings and good wishes of the devotees! “I am here”, said a lady in her early fifties, sealing the yellow vibhuti packets. I walked up to her and introduced myself. Hearing that I had come to listen to the vibhuti story, her eyes sparkled. The mountain of the mixed vibhuti which exits the machine is sealed into yellow, plastic packets and stored in trays. Then, Ramaniyamma gave a detailed description of how the process takes place. A truck arrives once or twice a month from Palani with the raw vibhuti and unloads the sacks at the unloading bay of the shed. Ramaniyamma takes a tub full of vibhuti and adds the perfumes in their respective ‘spooned’ proportions. The vibhuti in the tub is thoroughly mixed along with chanting of the spiritual hymns and mantras (no fixed ones though). This ‘concentrated’ vibhuti is now equally distributed into 40 small bags. A worker, Ratnakar by name, who has been in the ‘manufacturing facility’ for the past 40 years, then adds a sackful of raw vibhuti into the mixing machine. To this, he adds one small bag of the ‘concentrated’ vibhuti. Over the next hour, the machine mixes and drops the vibhuti which is ready for use. This vibhuti is transported in huge vessels to the packing area which is separated from the machine room by a wall. There are about ten ladies who, through sheer experience, place approximately 100 gms of vibhuti into yellow packets. These packets pass through the ‘balancers’ who place each packet on a weighing balance and remove/add vibhuti to total an exact 100 gms. These ladies then pass on the packets to the ‘sealers’ who press an electric handle to seal the packets. The Divine prasadam is ready to reach the devotee now. The Lord's helpers at work, ensuring that the most recognized signs of Swami's grace reaches every devotee's home in every corner of the globe. However, this process of packaging has also evolved over two decades now. In 1986, the original packaging involved a yellow paper cover into which the vibhuti would get filled. To prevent moisture from making the ash soggy, the paper packet would then be covered in a yellow-coloured, transparent plastic sheet. This would then be tied with a thin, white twine. This elaborate packaging was very labour-intensive. Ramaniyamma (in the background in light blue), apart from mixing the vibhuti, works with the electric-press sealing section too. In 1994, Swami spent almost 8 months staying at the Brindavan ashram in Whitefield, Bangalore. Naturally, the crowds in Brindavan were much more compared to those in Puttaparthi during that time. That was the time when, with Swami’s permission, Mr. Ruchir Desai (faculty at the Brindavan Campus and who till date manages the co-operative stores in Brindavan) started the manufacture of vibhuti at the Brindavan ashram as well. This was essential to meet the ever-increasing demand for vibhuti from the devotees. With great difficulty Ruchir Desai obtained the formula from Bujjamma. Bujjamma gave the formulation only after receiving confirmation that Swami had indeed instructed him to start vibhuti-making at Bangalore. On some days, more than a 1000 packets would be sold in a matter of hours and even shifting of the manufacturing process did not seem to solve the problem of heightened demand. The bottleneck for production was the packing process. In a bid to increase production to meet the growing demand from devotees and clear this bottleneck, Ruchir Desai approached Swami. He informed Swami about the existing packing method and sought blessings for a new packing method. Printed plastic covers were obtained which could be instantly sealed with a hot electric press. Swami selected the suitable design for the cover and also gave instructions on what should be printed on the cover. Thus, the modern packaging that we see today came into existence, again with blessings and permission from Swami. Ramaniyamma and her dedicated team of volunteers consider it a great blessing to be able to pack the greatest treasure on earth - vibhuti! They were once offered salaries for the 5-6 hours of hard labour they put in on a daily basis - without weekends, without vacations - but they flatly refused. It is with His name on their lips that these selfless volunteers silently go about their great service (left). The same is the story in Brindavan too, with the volunteer team there being headed by Mrs. Bhutia. and ready to spread the glory of His name. 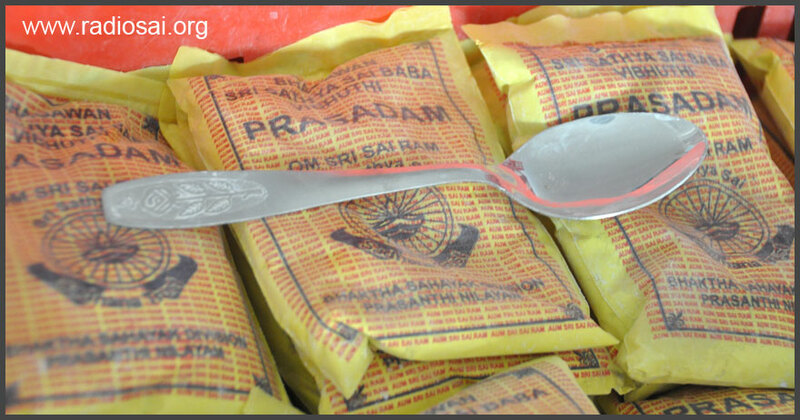 These apart, there is need for a separate team to make vibhuti packets that are made available as prasadam for every devotee visiting the ashram, either in the PRO office, security office or accommodation office. This separate team is constituted by very elderly ladies, some of them even in their eighties, who sit during and after the bhajans, packing vibhuti. Like the volunteers who are involved in the large scale manufacture and packing, these ladies too seek nothing but His Love for their efforts. 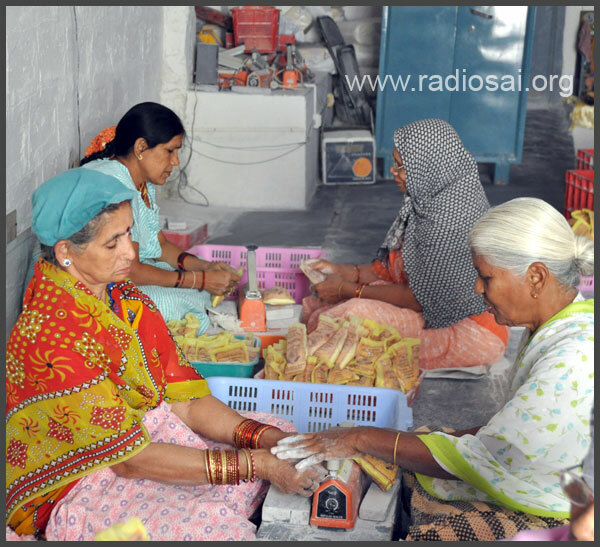 They can be seen silently doing their activity behind the bhajan hall in Prasanthi Nilayam, making small packets. These are 10 gms packets which are made from the pages of the 'Likhita Nama Japa Sadhana' books. These books hold the divine name, written thousands of times over, by devotees as part of their sadhana or spiritual practice. Once the book is complete, it travels to the ashrams where it gets transformed into the holder and carrier of the sacred ash. That, in brief, is the story of the vibhuti-manufacture. Though a lot of detail has been presented here one detail has been left out. And that is not because it was forgotten; it was more because it was taken for granted that everyone knows it. The most important ingredient of the vibhuti is the infinite Love and Grace of Bhagawan Baba that it always contains! The story of vibhuti-manufacture has many more experiences and narratives embedded in it and one article will never be sufficient to capture all that glory. But if any reader is keen to know these most fascinating tales, the best way would be to join this dedicated team and volunteer to pack the vibhuti when you are at Prasanthi Nilayam or Brindavan. That would be a win-win situation. You will get fascinating stories and a chance to be part of this magnificently divine process of making the mahaprasadam. The volunteer team manufacturing the vibhuti will get much-needed help in increasing their productivity to meet the burgeoning vibhuti-need worldwide. Those that wish to offer themselves in this labour of love may kindly contact the PRO (Mr. Murali) of the ashram at Prasanthi Nilayam. Those that wish to do the same at the Whitefield ashram may contact Mr. Ruchir Desai.